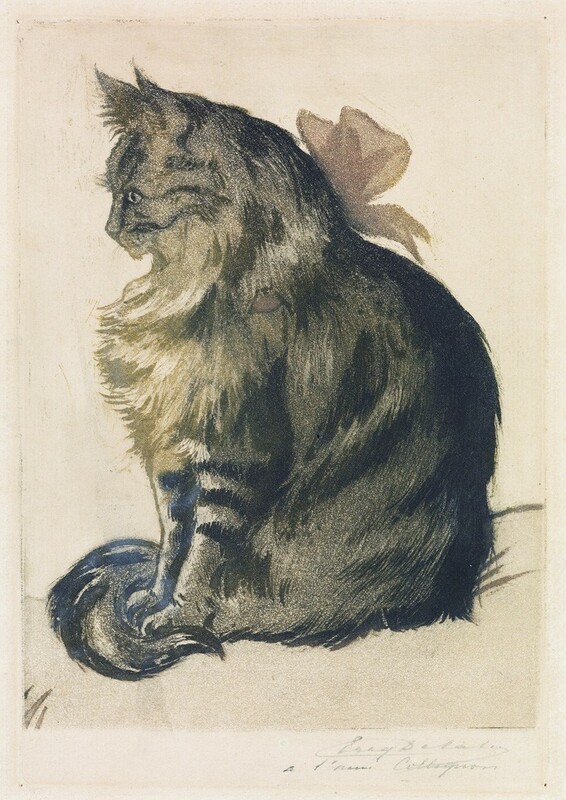 We have already covered the prevalence of cats in art, but our upcoming March 2 sale of 19th & 20th Century Prints & Drawings boasts an irresistible menagerie of friends beyond the feline. Animals have been the subject of man’s artistic endeavors since the dawn of civilization. Grand cave paintings show sinuous beasts cavorting across fields while humans were still depicted as stick figures. This fascination has not dwindled, if these charming and intimate portraits of creatures from the last 200 years are any indication. 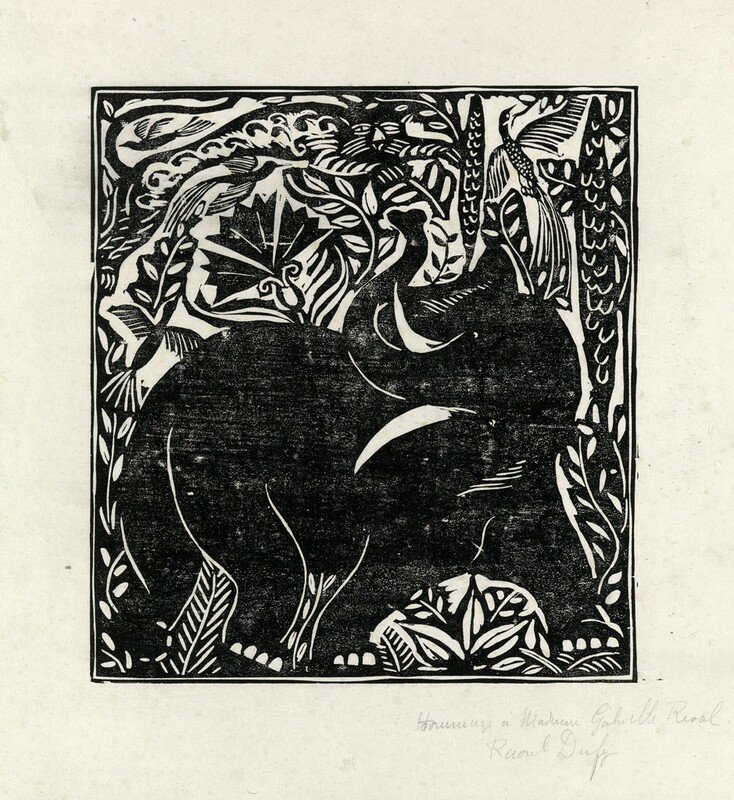 Lot 417: Raoul Dufy, Dauphin, one of two woodcuts, 1911. Estimate $2,000 to $3,000. Raoul Dufy is a painter known for his unique and exuberant canvases. 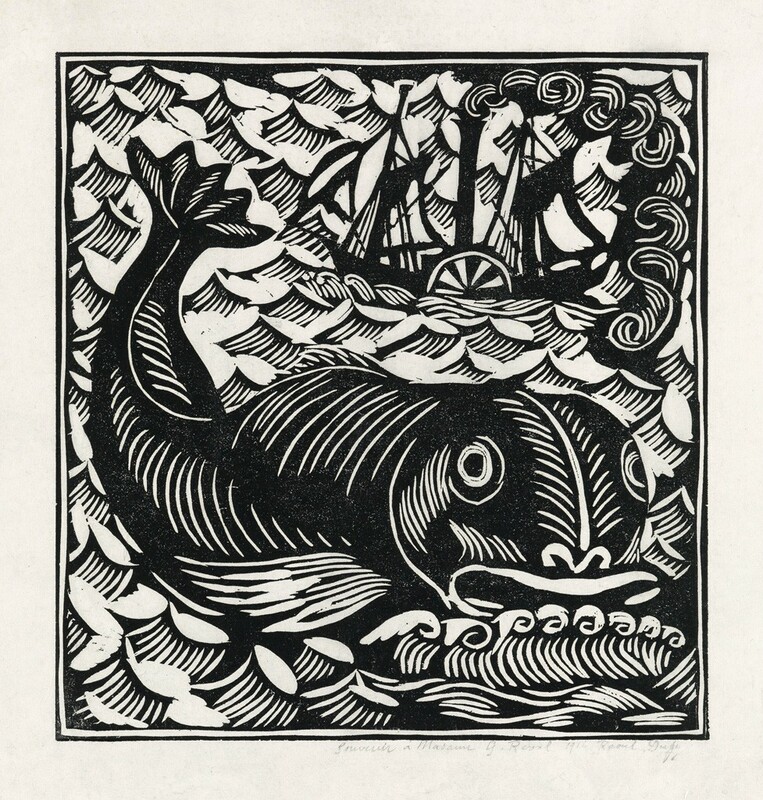 The woodcuts Dauphin (above) and Eléphante (below) were commissioned for Le Bestiaire ou Cortège d’Orphée, a collection of ten poems about Orpheus by Guillaume Apollinaire. The frenetic backgrounds lend their subjects vivacity and power. Lot 417: Raoul Dufy, Eléphante, one of two woodcuts, 1911. Estimate $2,000 to $3,000. 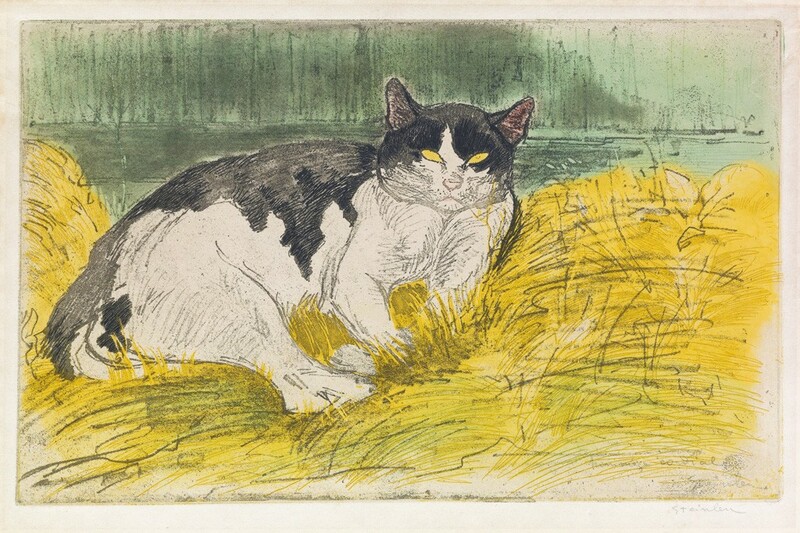 Lot 182: Théophile Steinlen, Vieux Chat noir et blanc dans l’herbe, color drypoint and aquatint, 1902. Estimate $5,000 to $8,000. It’s easy to see the joy these artists feel when they depict animals; strokes are loose and light, little paws are akimbo. This delight and improvisation can be lost in more formal works we associate with them. 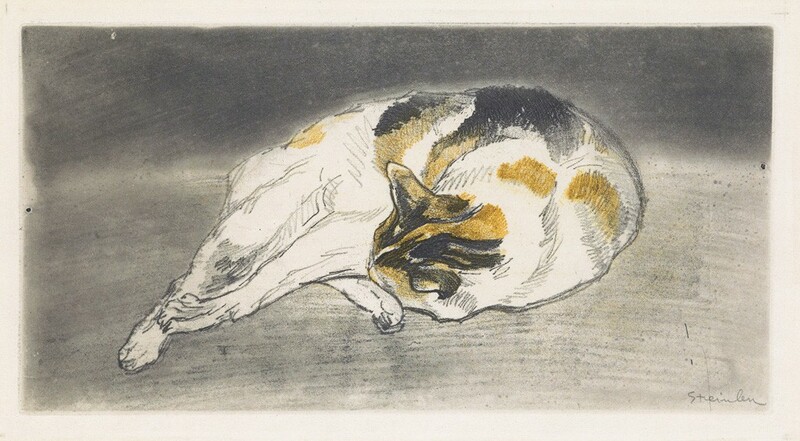 Lot 181: Théophile Steinlen, Chat couché allongé de droite a gauche tête appuyée contre les pattes, color soft ground etching, 1902. Estimate $3,000 to $5,000. Three prints come from the Collection of Eric Carlson, a historian and art dealer, embody the love of animal art shared by artists and collectors alike. This is evident in a portrait by Eugène Delâtre of Mr. Ginguelino, which translates to Mr. Little Ginger. Regardless of their relationship, it seems that Delâtre loved the cat very much. Mr. Ginguelino is given weight and a serious countenance despite his fluff and jaunty bow. Lot 19: Eugène Delåtre, Mr. Ginguelino, color etching. 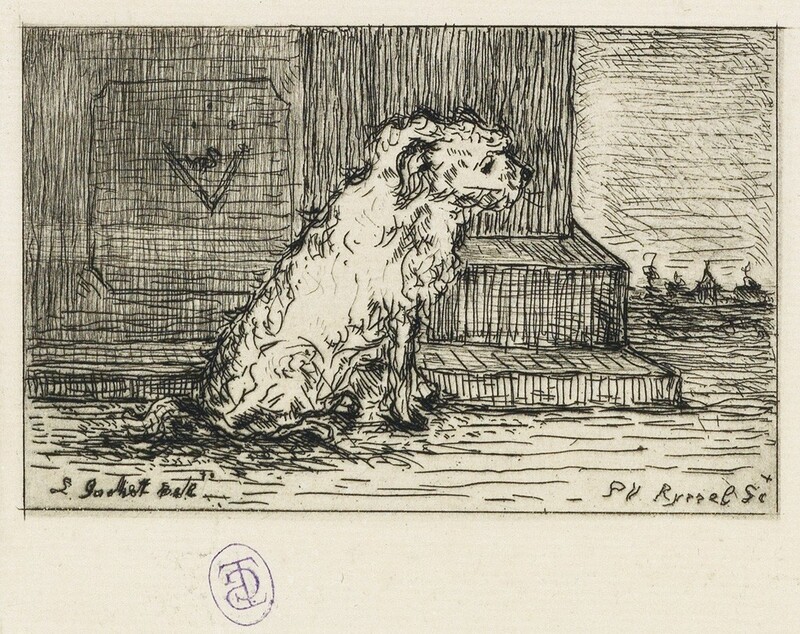 This trembling dog by Paul F. Gachet, also from the Collection of Eric Carlson, conveys the mood of the creature through quick, short marks. Gachet was a physician who treated many notable artists including Pierre-Auguste Renoir, Paul Cézanne, Edouard Manet and, most famously, Vincent van Gogh during his last weeks at Auvers-sur-Oise. 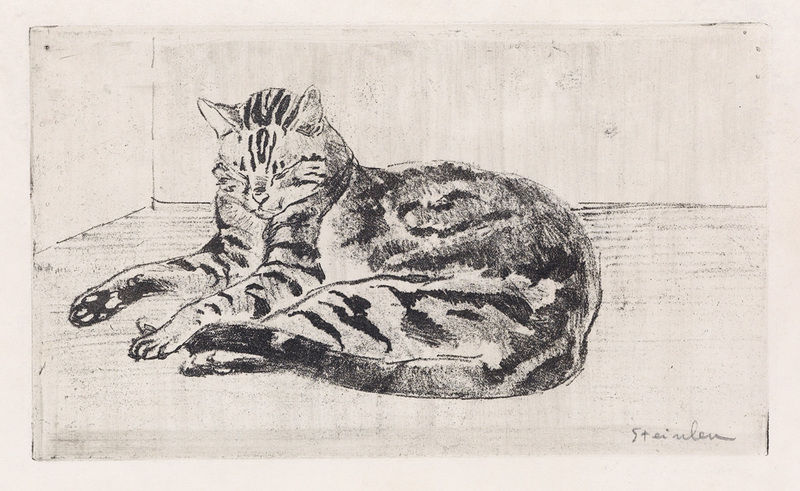 Lot 18: Paul F. Gachet, Chien, etching. Estimate $1,000 to $1,500. 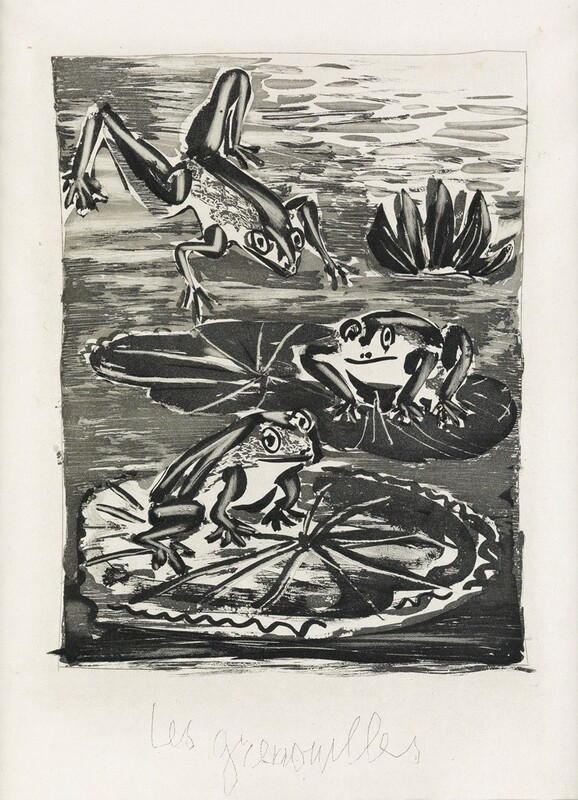 Lot 365: Pablo Picasso, Les Grenouilles, aquatint and drypoint, 1936. Estimate $1,000 to $1,500. Perhaps no artist’s love of animals can rival that of Pablo Picasso, who was continuously surrounded by creatures of all sorts. His love for them in not only well-documented, but eminently visible. For example, Les Grenouilles is so lighthearted it’s hard to look at it without laughing; yet the work was done in 1936, when the Spanish Civil War had either just erupted or was about to. 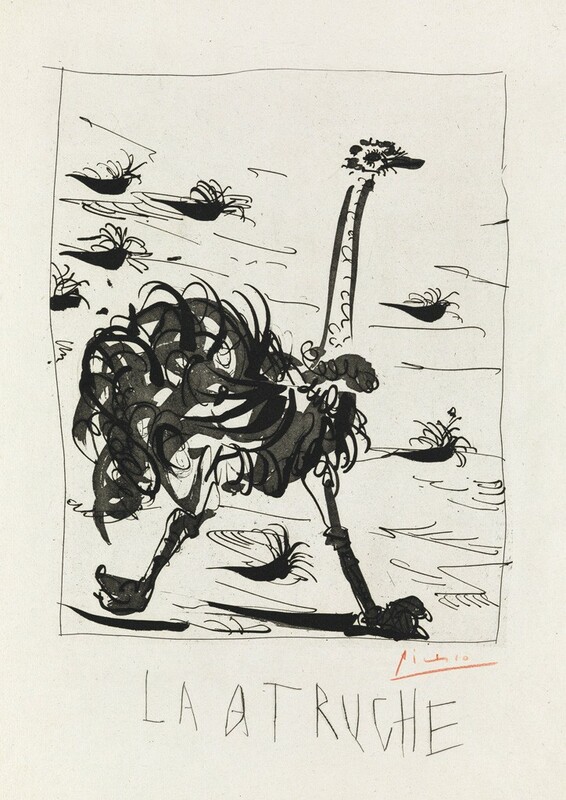 Lot 364: Pablo Picasso, L’Autruche, aquatint, grattoir and drypoint, 1941-42. Estimate $5,000 to $8,000. Les Grenouilles was part of Histoire Naturelle, a commission by the publisher Ambrose Vollard. Picasso illustrated 31 plates for the eighteenth-century encyclopedic work on the natural world, published in 1942. Two other works from this set, L’Autruche and L’Âne, are also in the sale. L’Âne, a donkey, has a noticeably darker tone than Les Grenouilles (frogs) and L’Autruche (ostrich). 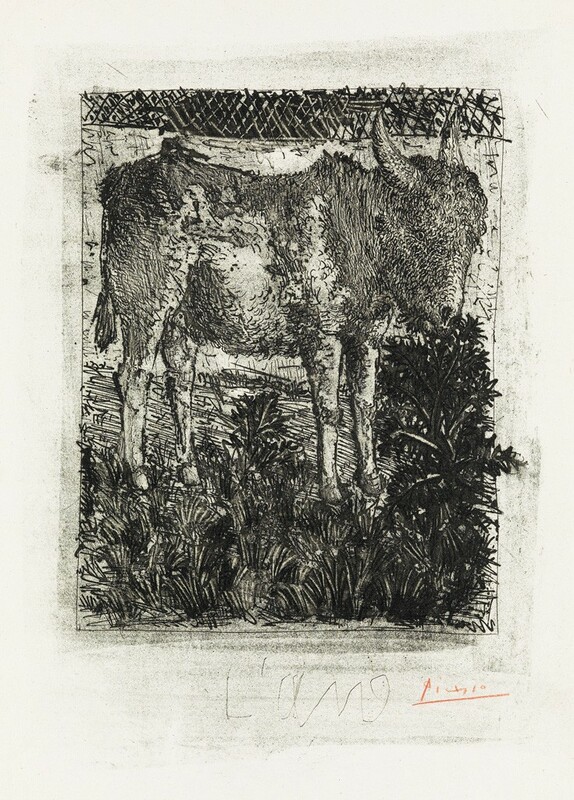 Lot 363: Pablo Picasso, L’Âne, aquatint, grattoir and drypoint, 1941-42. Estimate $7,000 to $10,000. Other beasts await in our full catalogue.